Beef jerky is the epitome of homesteading. 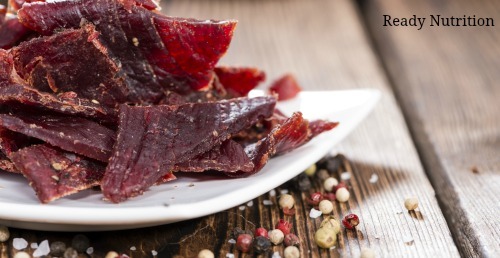 Our pioneer ancestors dried beef as a way to help them make it through the harsh winters and when food was scarce. Native Americans dried meat and enhanced the flavor by using dried fruits and berries by making pemmican. With meat prices steadily increasing at the grocery store, many are turning to purchasing bulk beef to save their budgets. On a side note, my family bought half a side of beef last year and we have currently been living off this. Not only was it a great way to save money and curb against price inflation, but it provided us with peace of mind knowing we had an ample amount of protein sources in case of an emergency. While placing my order, I asked that they cut some meat for making jerky and it turned out delicious! This high protein snack is a go-to food for those who are health conscious and hikers alike, but beef can also be dried and stored for later use, such as during an emergency. In my cookbook, The Prepper’s Cookbook: 300 Recipes to Turn Your Emergency Food into Nutritious, Delicious, Life-Saving Meals, I outlined how dehydrating or drying meat is the minimalistic way of extending the shelf life of your meats. In an emergency, you want to have shelf stable protein sources available. From a health standpoint, when meat is broken down in the intestines, it becomes amino acids that your body uses to build tissues and enzymes which are involved in the functioning of all body systems. It also has fat present to assist in additional body functioning and insulation of the major organs. While the lifespan of homemade jerky is significantly shorter compared to store bought jerky, there are ways to preserve the jerky for longer. Typically, homemade jerky lasts 3 months in a pantry. If refrigerated or frozen, it can last six months to a year. Which type of beef to use? The best type of meat to use for jerky are lean cuts of meat such as, sirloin, London broil, flank steak, top round, or eye round. You can use poultry, but I like to err on the side of caution and avoid using poultry due to food-borne diseases. Make precise cuts. Freezing meat for 5 hours will partially freeze the meat thus creating more precise slices for jerky. This also makes slicing more safe. Trim off fat. Because the presence of fat can cause meat to spoil more quickly, make sure you trim off any excess fat to prevent the meat from going rancid. Remember: you want your jerky to last as long as possible. Slice meat thin to ensure efficient drying time. Typically, people opt for cutting meat into 1/4 inch strips. In my cookbook, I discussed how you can re-use the syrups and liquids from some of your canned goods and add them to marinades. This helps you make use of everything you have in your pantry! Dark Belgian ale (yes, you read that right! ), honey, soy sauce, mustard seeds, garlic, and lime. Add some kick to your jerky with peppers! Habanero, jalapeno, or Anaheim peppers made a great addition (in moderation) to most jerky recipes. Add some unusual flavors to your jerky by adding some pineapple juice (Hawaiian jerky); some ginger (Asian jerky); or some curry powder (Indian jerky). Don’t be afraid to experiment! Allow the meat to marinate up to 24 hours before drying. *Realistically, you don’t need any additional seasonings or special cures to make jerky (although they really do add to the flavor). If you choose not to marinate, simply season the meat with preferred spices and seasonings, add to a bowl and cover. Refrigerate it for 15-24 hours. Once the marinating process is complete, drain the marinade completely and discard. Now comes the fun part- drying it out! You don’t have to have a food dehydrator to make jerky, although it certainly helps. This is dehydrator that I use and it has made many pounds of jerky throughout the years. For simplicity sake, I’m going to discuss the drying method I use: dehydrating. If you want to experiment using different drying methods, try one of the three listed above. Set up the dehydrator. Get your dehydrator set up and place meat strips on the dehydrator trays. Leave enough room between pieces to allow air to flow around the meat. This creates a more even dehydrating environment. Add any additional spices. If you want to dust the marinated meat with any spices like black pepper, red pepper flakes, etc., now is the time! Set it and forget it! Set your temperature to 250 degrees F and dehydrate until meat is completely dried out, up to 6 hours. Now that your jerky is ready to be stored, ensure that it has completely cooled off. Adding warm jerky into storage bags welcomes moist heat with is an enemy of your food stores. Once your jerky is cooled off and ready to be stored away, you need to determine whether you are storing for short-term or for long-term. Short-Term Storage for Jerky – Leave enough room between pieces to allow air to flow around the meat. If you plan on storing your jerky for a few weeks or up to a month, a ziploc bag will work. I usually use the ziploc bag for storing jerky and set it in the refrigerator so that it is preserved for longer. Add a desiccant to the bag to absorb any additional moisture. Storage Tip: One website claims that if your jerky is still too moist, a way to fix this is to store it in a paper bag for a short while before transferring it to a jar or ziploc. The paper bag will create a wick affect that will pull the extra moisture out of the jerky. Long-Term Storage for Jerky – If you are planning on storing your jerky for longer, there are a few other storage methods to consider. 2. Remove the lids from your mason jars and set them on a cookie sheet. 3. Put the jars in the oven for around 10 minutes. 4. Remove the jars from the oven using mitts and then quickly set your jerky strips inside of them. 5. Screw on the lids of the jars and let them cool to room temperature. As the jars cool they will create a vacuum seal. You will know when they are beginning to create a vacuum because you will hear a popping sound coming from them. 2. Food Sealer: You can use your food sealer to seal meat for longer-term storage. They allow you to keep the moisture in and the air out which is great because your jerky will still be somewhat soft but will have no oxygen to spoil. 3. Freezer: Your freezer is a great way to preserve your dehydrated meats. I prefer using food sealer bags as they have a more durable material and do a better job preventing freezer burn. Now you know everything there is to know about making the ultimate survival food. Next time you see some lean meats or roasts on sale at the grocery store, grab some up and do your ancestors proud by making some jerky for your pantry. That would fine and a great way to take advantage of deals at the store. Just dehydrate it thoroughly.